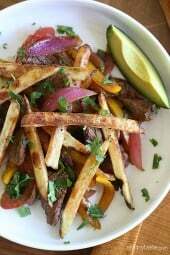 This dish is delicious, so easy and definitely my go to, kids love it. I do not care for drumsticks generally, but the fall off the bone chicken is so wonderfully tender, I enjoy the dish immensely! Thanks for a tasty easy dish for weeknights! I’m cooking this right now with boneless thighs. I’ve made something similar in the oven with similar ingredients and grainy mustard. I prefer the crockpot because you know it’s thoroughly cooked. 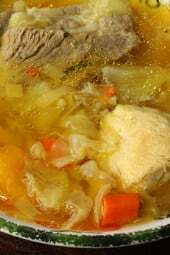 For those who haven’t used a crockpot before I would suggest looking up crockpot basics. There are some do’s and don’ts with crockpot cooking that are recommended. Not everyone abides by them but I think it is helpful. I couldn’t tell you how my oven will cook different dishes but I know my crockpot inside out. I can’t wait to try this tonight! Easy, delicious, and guilt-free. What could be better?I have a 6 quart instant pot which is my new favorite thing in the kitchen. I made this chicken two times in two different ways. The first I followed the recipe and used the slow cooker function. The only thing that was different was I used chicken legs instead (the store I like to buy my meats from didn’t have drum sticks). It was amazing when it was slow cooked! Fell off the bone and so tender and juicy. The second time I used a pressure cooker. I was a little nervous to do it by pressure cooking because I never done it before and I am attached to the slow cook method. I didn’t brown it before hand like many people do when they pressure cook. What I did is that i added some water, put in the legs with the mixture, and cooked it for 16 mins. After, I broiled it for 5 minutes so the skin could be very crispy. To my surprise, it was also very amazing. It was different in the slow cooker where as the slow cooker had the maple dijon flavor throughout the chicken while the pressure cooker it was the outside that had most of the flavor. Both ways the meat was moist which was nice. I think for next time if I pressure cook this recipe I would marinate it first in the maple dijon sauce. I did like the sow cooker a little more however I was impressed that both methods felt like I was eating chicken at a nice restaurant. can you make it with the skin on the drumsticks? 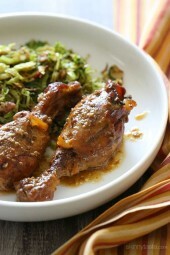 I made this recipe last night- I ended up making 12 drumsticks in my crockpot. While we were very happy with how tender the chicken was… we thought that it was overly sweet. I will be cutting back on the maple syrup next time! I have this on our menu rotation. It’s absolutely delicious. I end up making it in the oven but love the flavor!!! I have a smaller crockpot but would like to cook 10 or 12 drumsticks. Is it ok to have 2 layers of drumsticks ( I would double the sauce)? Just made it – really good. This sauce is excellent on salmon (in the oven) also. made this tonight, used regular french’s mustard in place of dijon, was absolutely delicious with a side of home fries and feta salad! Very good recipe… a keeper. I had chicken thighs and it was excellent. A bit sweet so next time I might add a few drops of hot sauce. Thanks for sharing!! I knew my boys wouldn’t like the working parts of the drumsticks so I followed the recipe exactly, except I used boneless skinless chicken thighs. My slow cooker seems to run high so I cooked them all day on “keep warm” which is the equivalent of low on my old crock pot. So good I added the recipe to my very selective keep binder.. This was really good. Everyone enjoyed it and I will definitely be making it again. It has such good flavor. I made it with boneless, skinless chicken thighs and shredded them in the crock pot after they were done which was real easy. We put it over rice with all the juice. Why is this so high in Carbs? Made this with boneless skinless chicken thighs. Cooked on high for 3 1/2 hrs. Was really good, served over brown rice. May add mushrooms next time. Made this today and enjoyed a delicious dinner that was so quick and easy! Since I used 10 skinless drums I doubled the sauce recipe, I wanted more sauce in my 6qt crockpot. I also made roasted asparagus and drizzled the sauce on the top. The chicken was so flavorful, this will be a repeat!! Can you make these in the instant pot by using another drumstick recipe as a guide? Would additional liquid be needed? Thank you! My family loved this! Has become a new family favorite! I just bought a 1.5-quart crock pot since I only cook for myself. Would it work to use smaller portions for recipes like this one? 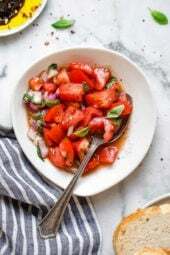 Is there an easy way to convert recipes into one to two servings? Thanks much! Also, I work 12 hours/day–is that too long to leave a small crock pot on low? Thanks again. My sister loves your SkinnyTaste Fast and Slow book, and I’m thinking of buying it myself. How can you adapt this recipe and put it in the oven instead? I baked it! It was great! Can I mix some boneless skinless chicken breast with the drumsticks? Would the time stay the same? LOVE this recipe and make it all the time. This has been a staple in our house ince I tried it a year or so ago. 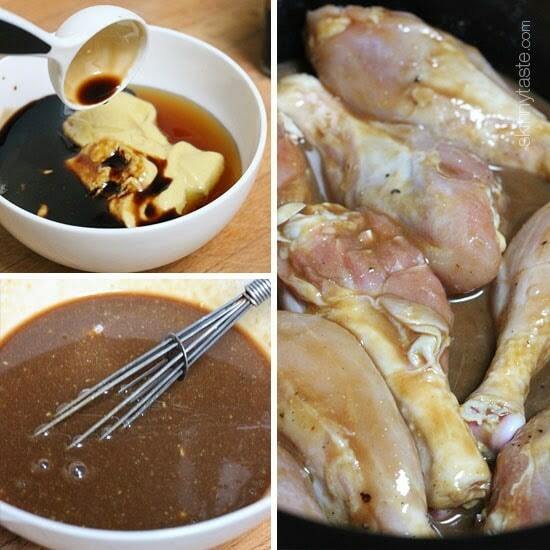 I always use 10 drumsticks, because thay’s how they’re sold here, and don’t change anything else about the recipe. It’s always delicious! Can I make this in my Instapot instead of slow cooking? I was wondering – has anyone tried this with chicken breast? any suggestions on what to use if you don’t have dijon mustard? Do you think it would be possible to replicate the recipe using chicken breasts? I’m not particularly fond of drumsticks so that would be a better choice for me. I’m gonna try doing it that way either way, but it would be nice to know if anyone else has done it successfully! 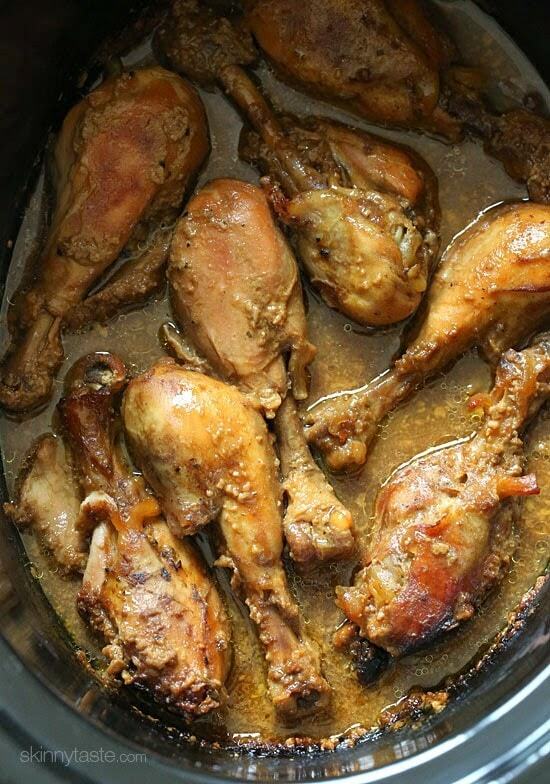 this is probably a silly question – but if i wanted to serve this to a group and basically triple the recipe so have around 24 drumsticks in total – can i layer them in my crockpot? will it work out ok? or should i be doing it on a pan instead? I don’t think they would fit, I might do this in the oven instead. I’m also making 24 drumsticks for a group. How did you end up doing it? Thanks! I don’t have a slow cooker, so I did these in my pressure cooker. I seasoned the drumsticks and cooked them in the PC for 5 minutes, then combined them with the sauce and a half cup of water in a saucepan. I let them simmer for a bit in the sauce, and kept spooning the sauce over them. I then pulled the drumsticks out and reduced the sauce briefly, until it was a bit thicker, and spooned it over the chicken when I served it. My husband and I loved it! Pingback: A Mama, Nana and Ava Weekend (well, sort of) Recap! Hello Gina–Have you prepared this in the oven and if so , at what temperature and for how long ??? any other tips for making this in the oven appreciated ..thanks !! I would probably bake it at 425F for about an hour? I put 6 drumsticks (the number in the package) in my crockpot on high. After 3 hours, they appear to be done inside. I think my crockpot gets hotter than some others, because I’ve managed to overcook chicken before. Haven’t tried it yet (it’s on warm until dinner time), but it was SO easy! Can you double this recipe? Thanks! You for all your hard work! I made it once. Very good. However, I tweaked the recipe a bit for the next time. It definitely needed some spice. I added quite a bit of crushed red pepper flakes to give the flavor some lift. Added some turmeric and curry to give an earthier flavor (just for the adventure). Very good recipe overall. Would 6 chicken thighs with skin work as well? If so, would it be the same cooking time on high? I tried it with the thighs, and it was delicious.. Don’t use breastmeat, though. It was too dry. I have 12 drumsticks, too many for my small crock pot. I have a very large ceramic-coated cast iron Cuisinart pot. What adjustments should I make to the recipe in order to do the drumsticks in the Cuisinart pot? Thank you. Could this be done in the Instant Pot? I have made this several times, it is awesome! What temperature, and how long if you do it in the oven? These were great! Cooking in a slow cooker never gives you a thick sauce/glaze so after they were done I put remaining juice/sauce in a stovetop pan and added a bit of cornstarch. I reduced it almost by 1/2 and it turned into a thick sauce/glaze. It was great over the drumsticks! Yes! I drizzled the sauce over quinoa and veggies on the side. So tasty and pleased the whole family. This is one of my favorites, I’ve always made it just as the recipe calls, but I almost feel like my chicken is TOO tender. The drumsticks are literally falling apart themselves. Am I cooking it for too long? I have always done 4 hours on high as directed. They do fall apart, you can cook it less time if you prefer they didn’t. I made this tonight and it was delicious ! I used boneless skinless thighs and it worked really well. I did double the sauce recipe and I’m so glad because it was so yummy! Thank you Gina for all your healthy and so tasty recipies. It’s always my first go to. Do you have a recipe for the side dish in this recipe? it look delicious! thanks! I just want to say your recipe are fantastic and making it a lot easier to eat healthy will actually enjoying the foods you eat!!! Thanks for what you do!!!! Happy new year! I made your shredded Brussels sprout side dish it was amazing! I am trying to find it on your site to make it again and I can’t…can you direct me where to get the recipe please? Since I have a few different recipes (and I am not sure which one you are referring to) I would to go the search bar and put in Brussels Sprouts. It will bring up all the recipes and you can find the one you’re searching for. 🙂 The one referenced in this recipe though is Shredded Brussels Sprouts with Proscuitto from the Skinnytaste Cookbook. I made this last night with boneless, skinless chicken breasts and it was so yummy. I also added in a sliced onion for extra flavor. Without sauteing the chicken first, there was some browning on the side of the crock pot and chicken, but the brown color from the meat was due from coloring of the balsamic and maple. Highly recommend this recipe! Did you change the cooking time when using boneless skinless chicken breasts? That’s what I will be using and am not sure if 4 hours on high might be too long and dry the chicken out. I am making this for a larger group. Will this still cook correctly in the crock pot with 12 drumsticks + more marinade/sauce to account for extra meat? My guess is yes, but I personally would do it in the oven. It looks delicious. I want to try now but i only have chicken breasts…can chicken breast be fine with this recipe? delicious dinner though I’ll admit I deviated a tiny bit by using a mustard I came across at Walmart called Inglhoff a world award winning mustard out of Oregon.. It’s a course ground mustard a touch of sweetness. Next time < try the Dijon, thanks so much, very good. Hi, I had this dish at a friend’s house and it was amazing!! My question is this, my husband has a sensitivity to garlic salt and powder so I tried with fresh garlic but the flavor was lacking. Any recommendations to still get that “full” flavortex without the garlic salt? What other sides would you recommend to go with this chicken? I will most likely use chicken breasts since that is all I have at the moment but my husband and I are not fans of brussel sprouts so just wondering what other sides would be good with this. Would be great with roasted butternut! Can I cook this on low? And if so for how long you think? And I was thinking about adding small red potatos…thoughts? can this be made in the crock pot casserole slow cooker? Would I need to make any modifications? I have made this many times. Gina, Can I make it with pork loin? I used 8 drumsticks and the sauce didn’t come close to covering the chicken. What now? I agree- I think she meant to make sure you pour the sauce over the chicken so that it does not get dry… not that the chicken has to be completely submerged. You can sub a different vinegar is you don’t have balsamic on hand. tried this tonight. not a favorite but not bad! went well with a baked potato, carrots and French bread. leftovers should last me half of this week, helpful since school begins Monday. a sidenote – half of the Dijon I used was coarse-ground which added a bit of texture that might not normally be there. still tasty. p.s. I appreciate how you have BOTH Weight Watchers point systems on all your recipes. I’m one of those PointsPlus rebels who has no intention of going to SP because PP works well for me. I lightly browned the drumsticks with skins on. Used applecider vinegar as it was all i had. Sliced some carrots very thin and a medium onion very thin. Put the legs on top the veggies and druzzled the sauce. Cooked for 3 hrs on high. Put over rice and oh my sooo delicious! Whole family raved over it. Thanks for sharing! Is it necessary to take skin off chicken? Will it still “work” with skin on? Can you use frozen chicken or do you definitely recommend thawed? Thanks! Looking forward to trying it! I have made this with chicken thighs in the oven before. I add fresh Rosemary when it’s done and it’s so good! I’m trying it with legs in my crock pot for lunch today. Can’t wait! Can. I use chicken breasts? Have made it with thighs, drumsticks, all delicious. Want to use breasts just not sure about cooking time, shorter? I haven’t made it with chicken breasts, but yes I would shorten cooking time. Can I put the chicken in frozen??? Wanting to make tonight…. Could you use sugar free maple syrup? Can you make this on te stove or oven quicket? This recipe is great! I could not have imagined that so few ingredients could create such a fantastic meal! I made the recipe exactly as listed. Once I turned off the crockpot I left the chicken in there overnight causing it to cook for a little more since the pot was still hot. I loved the turn out as it darkened the meat a bit. I also added cayenne for a bit more kick. Will definitely make again! Also, I didn’t have garlic salt so I used seasoning salt and garlic powder instead. I made this tonight and it is delicious! So simple to make with just a few ingredients. Definitely will be making this again. can I put breasts in there too? If so , would it change the cooking time? Can the drums be put in the crock pot frozen or do they have to be thawed ? I made this today. I used lite pancake syrup instead of pure maple as that is what I had. Cooked on low for 6 hrs and left on warm for another 45 min. I had to work and it would have been done too early if I did 4 hrs on high. It was very good. My husband doesn’t like dark meat and he liked it, too. Haven’t tried, but why not! Maple syrup isn’t a staple in my house. What would be an acceptable substitute? What is the salad on the picture 🙂 ??? It looks like her recipe for sauteed brussels sprouts with pancetta. what is the salad you have it paired with in the picture, it looks Delicious too! I cooked mine for 9 hours on low and they were perfect. 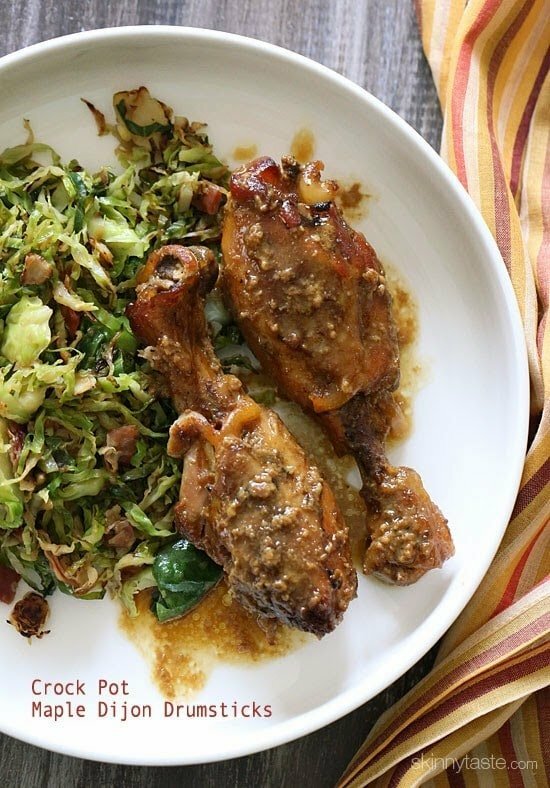 Would chicken thighs work for this recipe? I’I’m trying it tomorrow!! I can let u know. Anyone try it with chicken thighs? I have some in the freezer so I was going to make it tomorrow. Yes, you can use thighs. I only use boneless skinless thighs and they come out just as delicious. Put the lid on the crock pot or no? Unknown, you probably haven’t used a crockpot a lot, but all recipes in a crockpot use the lid-that’s the crockpots purpose to keep the heat in and slowly cook the meal..in fact they recommend usually that you don’t lift the lid unless necessary while it’s cooking the food. Hope this helps. I cut the skin off my drumsticks, measured everything exactly……even though I wanted to double the sauce but didn't. I cooked on high for four hours and OMG the chicken was so tender it was literally falling off the bones. I saved the sauce (there was about 1" left in bottom of pan. I will use when rewarming as a drizzle over the chicken. It was DELICIOUS. I will indeed be making this again. It is not too sweet, just enough to make you crave seconds. I honestly have no recommendations on adding anything else for it's perfect as is! I almost changed my mind for the pure male syrup was super expensive but I bought it and it made the difference. Can you put frozen drumsticks in the crock pot? I did, and I just cooked it for an extra 45 minutes. Still delicious! I made this recipe on Sunday and I just have to say it was so easy and my husband raved about it and even asked when I was going to make it again. Thank you for all your great recipes. Does anyone know how I could convert this recipe to work in an electric pressure cooker (Instant Pot)? I would just brown the chicken and set the manual pressure to 15 mins or use the poultry function if you have the 7 in 1 instant pot. Hi Can you tell me what you have this pictured with? Is that a cabbage salad? It looks great if you could share with me what that is. It is pictured with her brussel sprouts with prosciutto and shallots. The recipe is in her cookbook. They are fabulous! I just made this and it's absolutely amazing. I added some dried minced onion to the sauce mixture and it was delicious. Thanks for the great recipe! how did yours turn out browned? mine are a light color. Exactly my question too ! This chicken on the pic must have bean browned before it went in to the slow cooker or after it was done. So many recipes out there just like this , they “forget” to mentions the brow , saute , roast ect part. The slow cooker was on warm a few hours after it cooked and that’s how the color turned brown. I’ve made the 5 times, followed the recipe exactly, and my chicken turned out nice and browned like pictured. Did you know that the chicken needs to be skinless? I just made this last night. Delicious! So simple and I had all the ingredients on hand. I used 10 drumsticks instead of 8 in my crock pot and there was still enough sauce for everything. We'll be making this one again for sure!